At SMO Energy, our history as Prince George’s County go-to propane delivery provider goes back more than 90 years. Our role as a trusted propane provider is one we’ve built over the decades because of our exceptional services, which include our transparent pricing, expert teams, large delivery fleets and dedication to you, our customer. Easy ordering: Pick up the phone, log onto your tablet or computer or wait for us to call you with our straightforward process for ordering heating fuel. Order fuel as-needed or sign up for our free automatic delivery to ensure your tank is always full. Reliable emergency service: When your propane heating system stops, you want to have a company you trust on-call. That’s why we make ourselves available 24/7, 365 days a year. With the help of our friendly and experienced representatives, you don’t have to wait out the night, weekend or holiday for assistance. Convenient budget plans: Competitive winter propane heating prices in Prince George’s County can still leave you wanting a lower bill. With our SmartPay Budget Plan, we make lower heating bills a possibility. To reduce your invoice, we calculate your annual fuel usage to provide you with a low monthly rate that’s paid over the year. No-hassle account access: Paying your bills, reviewing your statements and scheduling deliveries are paperless processes with our free online account portals. Log in and take care of everything you need in just a few minutes and then move on with your day. It’s as simple as that. Propane conversions: Even with the best heating oil prices in Prince George’s County, you may want to switch to propane — a cleaner heating fuel that’s also more cost-effective and efficient than heating oil. Our team is ready to help you convert to propane, which also includes a credit up to $1,000. Propane consultations: Whether you want to update or replace your existing propane tank, we can help. Through our meetings, we offer our professional recommendation when it comes to choosing a new tank or heating equipment. We also provide our assistance when it comes to hooking up your new hardware. Propane installations: With our propane specialists, you can trust that your leased or purchased propane tank is installed safely. Our team follows several safety precautions, which include gathering the correct permits and placing the container at the appropriate distance from your home. Preventative maintenance services are also available from our experienced technicians. 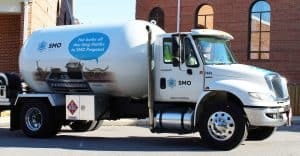 For propane and heating oil in Prince George’s County, trust SMO Energy. As one of the largest family-run businesses in Maryland, families, and businesses across the state trust our team and high-quality heating fuel to make their houses and facilities comfortable throughout the year. Keep your home toasty with SMO Energy by requesting a free quote today for propane heating prices in Prince George’s County!